Mee rebus sauce is tedious to make and it goes off fast, so it is best not to keep it over-night. As you can imagine, in order for any stall to be making money, they should have a good “following” i.e. a steady number of partons per day – or else all that sauce will be wasted! 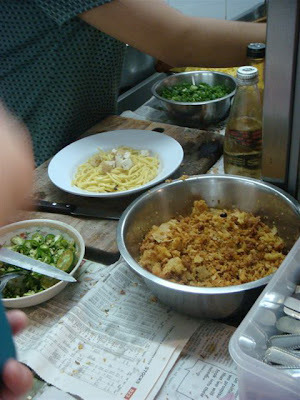 One of the mee rebus I love is the Uncle Don mee rebus originating from Johor. This Uncle Don is the Son of Haji Wahid mee rebus made famous in JB. Son-of-a-gun. His mee is good. The reason why I particularly like this Mee Rebus is because of the GANJA they put on top. Yup.. the nice yellow crispy bits! Try crunching into it and see if you don’t get addicted! The Mee Rebus, Satay Johor, Char Kwey Teow, Murtabak, Rojak and even that oh-so-yum-dessert, the WAFFLE are amongst the food you can get here, and they are all pretty good. the mee rebus looks mouth watering…I haven’t ate mee rebus for ages…one of these days must go hunting for nice mee rebus in Penang! is the kacang pol stall still around??? ehhh…how come i missed all the last 3 posts ar? hmmm…. anywayz, love those GANJA on the mee rebus! so accessible somemore! must try! lurve JB’s mee rebus!